Rating - Click the link below to read the review and see the rating! The same day McDonald's introduced the Juicy Chicken-Filet O they also changed the original Shaka Shaka chicken to the New JUICY Shaka Shaka Chicken. 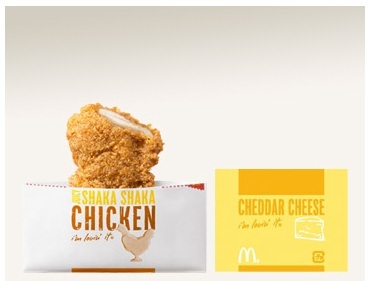 The idea of the Shaka Shaka is you dump your flavour pouch in the top of the paper bag, and much like the Shake Shake Fries in Hong Kong, you are supposed to shake it around to coat your piece of chicken with the flavouring. The paper bag the chicken is served in has a perforated centre, so when you are done shaking it, you tear the bag in half and you can eat the chicken using the paper as a handle so you don't get your hands full of seasoning powder (see photos below). I've actually tried the original Shaka Shaka Chicken (with Lemon and Black Pepper flavouring) and I was always enjoyed them, but its not something I would eat all the time. With the introduction of the new 'Juicy' variation McDonald's Japan has introduced Red Pepper and Cheddar Cheese flavouring mixes which I did enjoy more than the original. My friend and I only ordered one piece because it was late, and we were already going to force down the Juicy Fillet-O sandwich for the sole purpose of this blog. But when the woman who took our order asked Red Pepper or Cheese, I asked 'One and One?' and she smiled and gave us one of each. When asking for more than one flavouring packet in Japan (and Hong Kong) previously I was denied, I guess at midnight she felt sorry for two large foreigners coming in and ordering a meal for one. 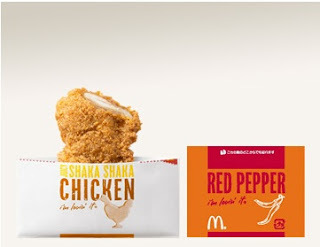 Instead of dumping the flavouring inside the bag and shaking (therefore being able to try one flavour), we dumped them each out onto the paper tray liner and dipped the chicken into it. This gave us a less even coating on each bite, but it allowed us to try both flavours. I was also able to try dipping my burger into the flavouring which seeing as it was the same 'Juicy' chicken thiegh meat, it wasn't a bad idea to be honest. My friend wasn't to enamoured with either, and vocally disliked the Cheddar Cheese but I found the Cheese to the better of the two. Both were heavy on the salt/MSG as expected. But I felt the red pepper tasted almost nothing like the Chilli Peppers they show on the packet, where at least the Cheese tasted like fake cheap Kraft Parmesan cheese. The Chicken itself was smaller than the original Shaka Shaka pieces, but tasted a lot better. Seeing as it is the same meat as the Juicy Fillet-O, read my review on that for a better description of the meat. If you enjoy reading this blog, please leave a comment below. I do get a lot of readers, but no one ever comments or leaves feedback. Please, let me know what you like, dislike, or anything else at all. I'm from Hong Kong. When I was a kid I really enjoyed the Shake Shake fries from McD's. But now I find them too salty/MSG-y, and they no longer have the flavour I liked - spicy barbeque (?). By the way, cool blog! Why do you get to travel so much? Thanks for the support! Its always nice to see some feedback from readers. Makes me not feel that I waste so much time searching out new items to try and writing these reviews.